Rupert Pupkin Speaks: Film Discoveries of 2017 - John Cribbs ""
Watching a different swashbuckler a day in tandem with my Pink Smoke partner Chris Funderburg turned out to be my favorite self-prescribed slate of movies in 2017. I revisited favorites like CAPTAIN BLOOD and SCARAMOUCHE while also discovering new favorites such as THE SPANISH MAIN and AGAINST ALL FLAGS. Diving into the silent era of swashbucklers was particularly gratifying: besides the terrific Douglas Fairbanks films (oh man is THE BLACK PIRATE fun! ), there's a silent version of SCARAMOUCHE (directed by Rex Ingram) that is phenomenally great. 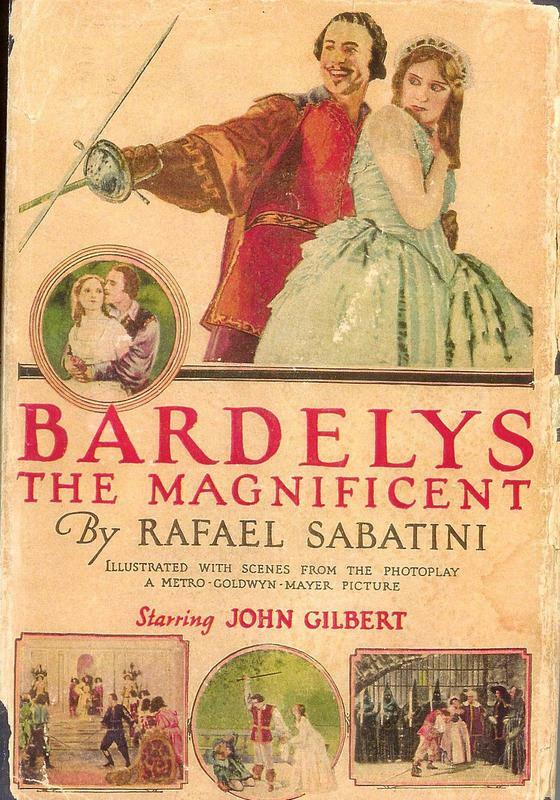 Like that classic, BARDELYS was adapted from an adventure novel by the great Rafael Sabatini and set in France, "in an age of light loves and lively scandals." It features a charming rogue inadvertently caught up in some political intrigue who is ultimately redeemed through his blossoming relationship with a beautiful woman. 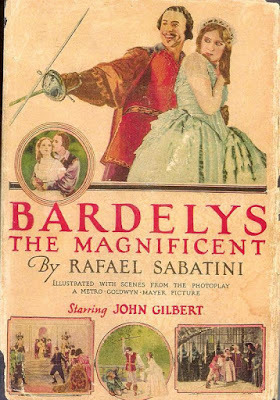 The eponymous personifier of magnificence is played by John Gilbert in one of the actor's several collaborations with King Vidor, whose extravagant direction and deft touch at Hollywood romance (Bardelys's wooing of Roxalanne de Lavedan on a boat while rowing through heavy foliage is absolute bliss) make the movie unmissable. Although, for many years, it was entirely missable: BARDELYS was long thought to be lost until a print was discovered in 2006. Lovingly restored (reel three is still missing, but it's covered using stills and screen titles), the film was released in a DVD set by Flicker Alley a few years ago along with a nearly-complete version of the 1922 MONTE CRISTO, also once considered lost, which stars Gilbert as Edmond Dantes. It's unfathomable that modern audiences might have been robbed of such a stupendous early swashbuckler, particularly a rousing climax that finds Bardelys escaping the gallows by climbing, swinging and swordfighting dozens of soldiers (19-year-old John Wayne is apparently in the crowd somewhere, although I must have missed him). Speaking of deliriously stunning climactic set pieces, anyone who doubts that the wuxia film was highly influenced by swashbucklers need only witness QUENTIN DURWARD's final epic battle in which the dueling hero and villain cross swords while SWINGING FROM BELL ROPES OVER A RAGING FIRE! The thrillingly crafted scene, illustrated on the film's excellent poster, showcases stunts and effects that feel modern over 60 years later (I immediately thought of the poles-over-fire three-way fight of IRON MONKEY). It makes you wonder why Hollywood action films of the 50's weren't routinely mixing three awesome things together in the same scene. There's plenty to love leading up to the film's towering finale: lots of court machinations, fights on moving carriages, Robert Morley as a wonderfully conniving Louis XI (it's also one of the few star turns for the lovely Kay Kendall, who died tragically young). 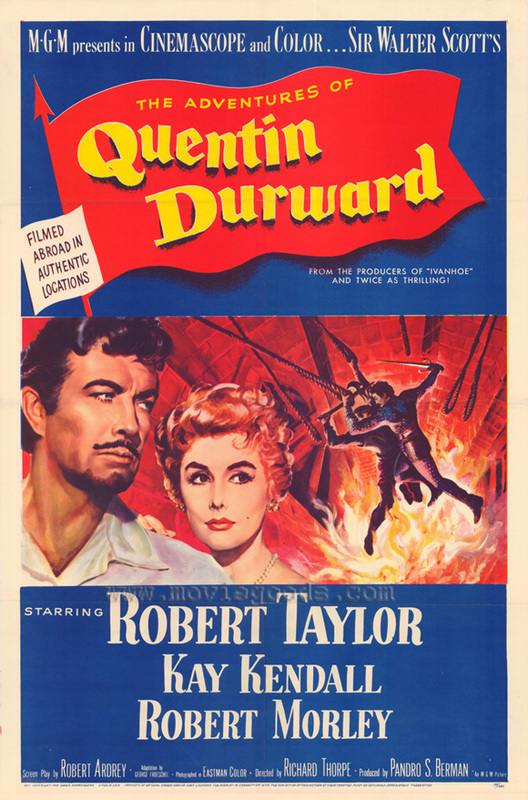 Director Richard Thorpe and star Robert Taylor had previously teamed up for a 1952 adaptation of Sir Walter Scott's more famous work IVANHOE, but despite featuring Robin Hood's crew as supporting characters that film's not easily categorized as a swashbuckler. DURWARD, on the other hand, has everything a fan of the subgenre could ask for: its undercover plot even ties it to excellent swashbucklers THE BLACK PIRATE and AGAINST ALL FLAGS, in which Fairbanks and Flynn respectively join a pirate gang to take it down from the inside. Like BARDELYS, it was distributed by MGM (they thankfully didn't destroy all existing prints of this one) and remains woefully underseen, although it's been made available through the fantastic Warner Brothers Archive Collection. It was a big deal at the time (it was even turned into a Dell Four Color comic) and deserves to be a big deal now: why actors like Russell Crowe and Taron Egerton aren't vying to play a new version of Quentin Durward is totally beyond me. Rather than ending in fire like QUENTIN DURWARD, this film opens in fire as an entire clan is raided and wiped out in a devastating onslaught. Years later, the survivors of the clan have been scattered to the winds, doing what they can to survive - one among them still seeks vengeance against the lord responsible for his family's death and looks into profiting from his personal vendetta by becoming a hired ninja spy. What transpires is all the secret meetings, botched assassinations, flying blades and ambushes between bamboo trees you'd ever hope to find in a ninja movie. Having spent the last 25 years of my life seeing as many samurai films as possible, I somehow missed out entirely on the ninja jidaigeki. 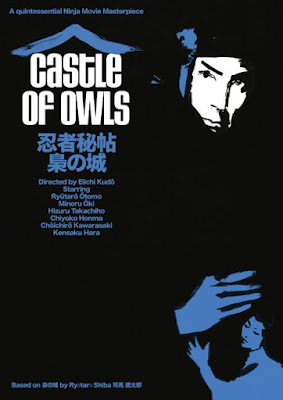 The brilliant illustrator and Japanese film expert Tony Stella (that's his poster for OWLS above) hipped me to their existence and I'm extremely grateful. OWLS especially is a surprising film: instead of wall-to-wall violence, Eiichi Kudo, who also directed the classic 13 ASSASSINS from the same year, really digs into the human drama of this revenge-seeking warrior (since he's usually in ninja garb, star Ryûtarô Ôtomo does most of his acting through the eyes). When one former ally is hired to murder him and they meet up in full ninja gear late at night on an empty street, they don't fight - they sit on the steps and talk about it! Which doesn't mean there isn't going to be a satisfying showdown between them in the rain at the end - there are plenty of incredibly cool moments. My favorite is when Hizuru Takachiho is confronted with whether she's willing to turn traitor out of love for Ôtomo. She plunges a sword into her foot soldier before turning and stating, "There's my answer." Some films are excellent standalone efforts, others standouts from a series of films. And then there's the odd title that can only be fully appreciated after immersing oneself into a very specific kind of movie, like the very weird world of Bruceploitation. Which is what I did at the beginning of the year, to prepare for a presentation at Kevin Geeks Out at the Nitehawk Cinema in Brooklyn. (For more about that, visit Kevin Maher's "2017 Discovery" list.) For roughly a decade following the Little Dragon's death, dozens of films were churned out as if Bruce Lee were simply a brand from which countless imitations could be mass produced. 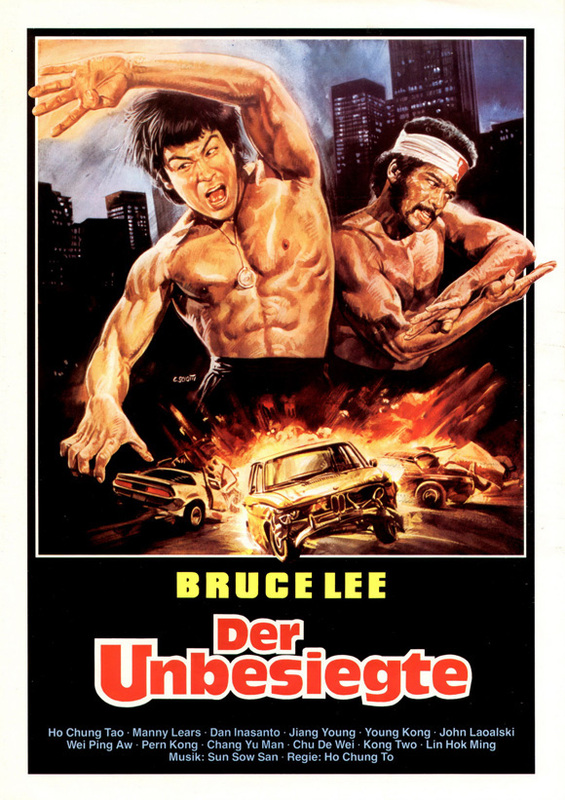 While I can't help being fascinated by this phenomenon, from the truly Bruceploitive (BRUCE LEE FIGHTS BACK FROM THE GRAVE) to the flat-out bonkers (THE DRAGON LIVES AGAIN), there's undeniably a seediness to the entire venture, even the classiest entries like GAME OF DEATH. The most prolific of Bruce clones was James Ho Chung Tao. Rechristened "Bruce Li" by the Hong Kong film industry, he was called upon to do everything: he played Bruce, he avenged Bruce's death, he battled gorillas in the jungle. Between 1974 and 1982, he made 30 films with titles like THE DRAGON DIES HARD, EXIT THE DRAGON ENTER THE TIGER, FISTS OF FURY II and WANTED! BRUCE LI, DEAD OR ALIVE. Many were fun (see: SOUL BROTHERS OF KUNG FU), but all were shameless knock-offs - Tao not only languished in the icon's shadow, he built a house there. Which is what makes CHINESE STUNTMAN such a profound piece of kung fu cinema. Tao directs and stars as stuntman to a famous international action star who discovers the studio plans to murder him for the insurance money. Each attack on Tao's martial artist (there are several excellent fight scenes) wears him down further until he finds himself in a final knockdown brawl on every floor of a teahouse, which ends with the combatants pushing each other out of the top window. Tao walks away from the fight, alive but deeply scathed. One of the movie producers shouts at him to come back, but he doesn't even turn around. Tao would never make another film. I've slowly been collecting all the Universal Classic Monsters Collection videos from the early 90's over the last couple years. While I've had no trouble tracking down most of the core monsters at flea markets and used book stores (still have my eye out for a few Mummy and Invisible Man sequels), it's a rare treat to stumble upon one of the second or third tier titles of the series like HOUSE OF HORRORS or MAN MADE MONSTER. THE MONSTER AND THE GIRL is a particular oddity: for one thing, it was originally distributed by Paramount Pictures, not Universal. And the "monster" of the title is no more than a massive gorilla that happens to have the salvaged brain of a man who was framed by gangsters and executed by the state transplanted in its head, care of mad scientist George Zucco (who clearly learned nothing from his human-to-ape experimenting, since he'd be up to it again in DR. RENAULT'S SECRET the following year). Once you move past some stiff courtroom drama this becomes a revenge film like no other, with a kill list of crooks subjected to furry vengeance. It's a fun size King Kong, the spiteful simian getting even while also protecting his sister (Ellen Drew, the suspected vorvolaka from ISLE OF THE DEAD). The high-running emotions make this a perfect double feature with fellow Classic Monster Collection inductee CAPTIVE WILD WOMAN (which features a reversal of MONSTER's plot, a female ape gets turned into a human lady). 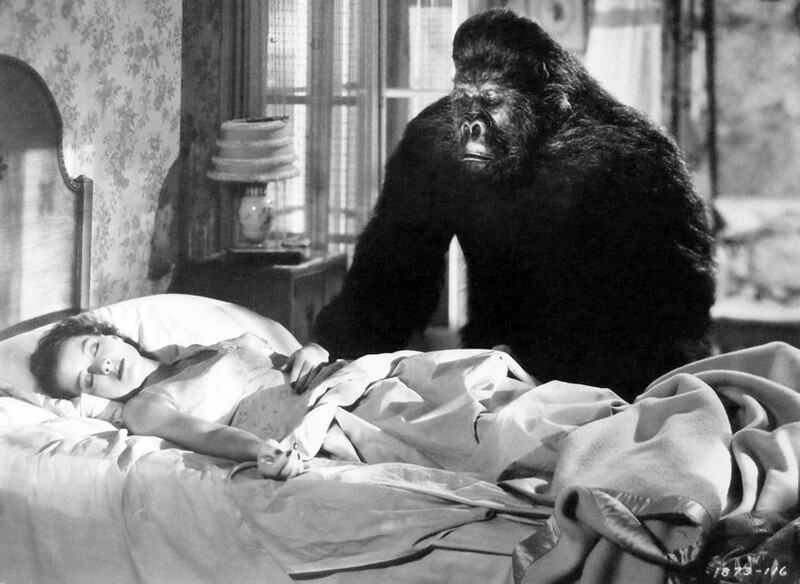 The highlight of the film is the ape suit itself, beautifully sculpted and acted by "King of the Gorilla Men" Charlie Gemora. Also worth nothing: he's got a dog sidekick. There were a lot of sad coincidences in my film viewing this year. I revisited Jean-Pierre Melville's outstanding LEON MORIN, PRIEST right before Emmanuelle Riva passed away. Plowed through Walter Hill's entire filmography, including SOUTHERN COMFORT and EXTREME PREJUDICE, only to hear we'd lost Powers Boothe a few weeks after. I enjoyed Don Rickles in his very memorable "Tales from the Crypt" episode literally the day he died. Tobe Hooper was inarguably the toughest loss for me personally. He's one of my very favorite filmmakers and made one of my all-time favorite movies. But weirdly, I hadn't gotten around to his last film until it popped up on Netflix early in 2017. I hadn't heard anything good about it. Most reviews were negative. I guess I was worried it would be terrible. The opposite turned out to be true. DJINN is an excellent film, easily the best thing Hooper had done in almost 10 years. Set in the United Arab Emirates, it's the story of a young Emirati couple trying to recover from the death of their child by returning to their home country and moving into a high-rise apartment outside Ras al-Khaimah. The building itself, isolated in the middle of fog-shrouded void, turns out to be as coldly menacing as any of Hooper's trademark haunted institutions and sets its insidious sights on the vulnerable Salama (Razane Jammal, giving just the kind of astonishing performance that is never going to get the attention it deserves). Trapped in the high-rise, she's subjected to fits of grief, anxiety and terror through the entire tense second half of the film. I'm glad that, before Hooper passed away, I was able to catch up with his amazing swan song: not only one of his best, but one of the best final films I've seen by any director.